In 1999, Joey visited mainland Honduras for the first time with a Youth for Christ mission team. 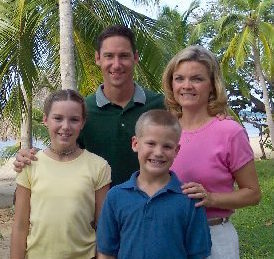 By Spring 2001, the decision had been made for our family of four: Joey, Angie, Alysha, and Jeremy, to move to Roatán to work with a new orphanage project. We made the initial journey in August, 2001. Though Joey worked with the orphanage project for a few months, it became clear early on that there were leadership issues and that a change for us would be necessary. After considering an immediate return to the U.S., we decided to stay for at least one year, and ended up staying for two. Visit the photo gallery below for a glimpse into our time living on Roatán. After returning to the U.S. in 2003, we maintained our connections with many people in Honduras, and we began taking teams of people to serve once or twice a year. We also started a non-profit organization to continue to allow ourselves and others to financially assist the people of Roatán.